Undoubtedly man contributes to global warming. But by looking back in time to study past warming and cooling cycles we can determine the magnitude of nature’s influence. It is important to understand the climactic background in which man is off gassing. This isn’t a debate about whether man has a role in global warming or not. This is an explanation of nature’s contribution to the global warming that we see. Let’s take a look back in time at these natural cycles. The earth’s tilted axis is what causes seasons on Earth. As the moon retreats, every day it has less ability to keep our axis vertical. The moon is essentially “losing it’s grip” on us. This is why the earth wobbles, because the moon is holding it less and less steady each day. The dynamic feedbacks of melting ice, and even earthquakes and tsunamis, have the ability to alter our axial tilt. Because of this loosening grip we have slipped in and out of ice ages over millions of years. A shift in seasons is currently a big player in global warming. Our tropical zone is expanding as the earth tilts more and more. Many don’t realize the importance that the proximity of the moon and its role in Earth’s tilt, plays in our temperatures here on Earth. The spinning of a well-balanced top, or better yet a gyroscope, is analogous with planetary rotation. In the earth-moon system the presence of the moon has a powerful influence on the orientation of the spinning earth’s axis. Without the moon the earth’s axis would point in no particular direction and the earth would spin indiscriminately, like a gyroscope. The sun and other planets have a relatively small influence on the earth, compared with the power of the earth’s unusually large and relatively close moon. The moon’s orbit is not around the earth’s equator as might be expected. The moon’s orbit around the earth is closer to that of the ecliptic (the plane that all the planets go around the sun). The moon’s orbital plane around the earth is tilted only 5 degrees from the plane of the ecliptic. The moon is caught in a tug-o-war between the earth and sun. The sun holds the moon in the plane of the ecliptic, that imaginary plane in which the earth and planets revolve about the sun. The earth, on the other hand, attracts the moon towards its bulging equator. The spinning earth is actually somewhat flattened at the poles and bulging at the equator. This “not round” imbalance of the earth actually attracts the moon towards the earth’s relatively more massive equator bulge. This is why the distance of the moon from the earth is so important. As the moon moves further from the earth, its gravitational influence on the earth’s equatorial bulge weakens, and the tilt of the earth can increase. When the moon is far away, the earth can tilt and wander. 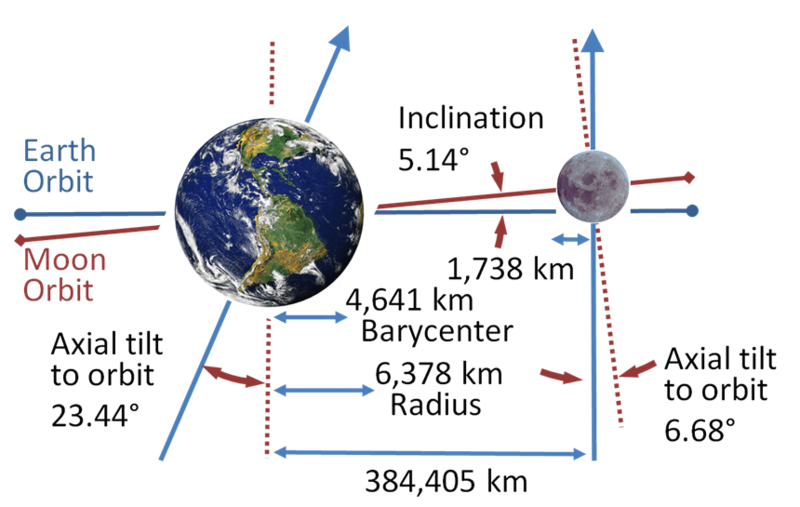 Conversely when the moon is closer to the earth it pulls the earth’s bulging equator down towards the plane of the ecliptic, where the moon is held by the pull of the sun. By definition, when the equator of the earth is in the plane of the ecliptic, the earth’s axis is straight up and down. Therefore when the moon is close to the earth then there is no tilting of the earth’s axis. The moon’s axis is nearly vertical, tilting only 1.5 degrees, unlike the Earth which is tilted 23.4 degrees. A rising sun over a frozen earth with a distant moon. Artist Karen Carr. The Close Approach Lunar Model (CALM) proposes an alternate view of the proximity of the earth to the moon over time. It is the commonly held belief that the moon has slowly been retreating from the earth since the formation of the solar system. Alternatively, the CALM postulates that for billions of years the moon was slowly retreating from the earth, much as it does today. Then the moon’s orbit “collapsed” and the moon circled in toward the earth during the Proterozoic, only to be bounced back out again during the Mesozoic to where we see it today. 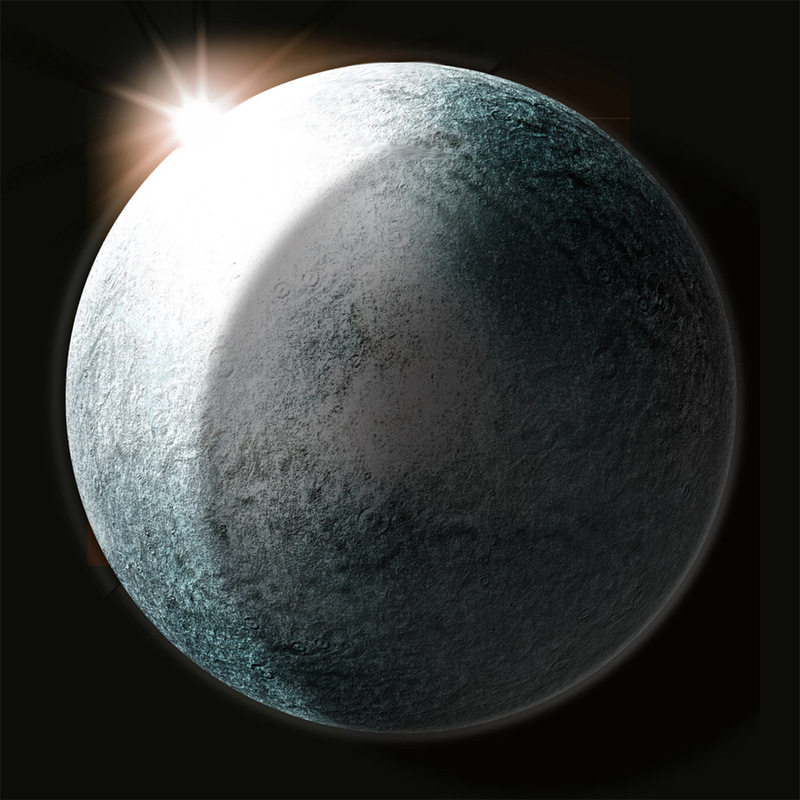 The earth’s axis began to wander during those initial years of the moon’s retreat, as evidenced by the snowball earth event. We have seen that during the Cryogenian (720-635 mya) extensive ice sheets covered much of Earth even at the equator. A tilting of the earth’s axis of up to 54 degrees is suggested for this “snowball” earth event. The CALM puts forth that as the lunar orbit began to collapse and the moon fell back in towards the earth, the moon caused the earth’s axis to become more vertical. Then, as the moon was bounced back out, its influence over the earth’s tilt weakened. As it retreated the earth slowly began to tilt once again. It is this continued tilting that has caused the seasonality we see today. There are other factors, generally described as Milankovitch cycles, which contribute to climate cycles as well. One example of these is the varying relationship of the earth’s revolution around the sun. Sometimes the shape of the earth’s orbit is more circular and other times more elliptical. This impacts solar radiation on the earth and therefore climate. The various cycles can be detected and are used partially to explain Earth’s current cycle of ice ages. At times during the geologic past, however, these Milankovitch cycles can not be seen. This is because they were masked by the denser atmosphere of the Jurassic period, higher sea levels of the Cretaceous period and the generally more vertical axial tilt of the Mesozoic. The high sea levels of the early Cretaceous (145-66 mya), the last period of the dinosaur age, moderated global temperatures. 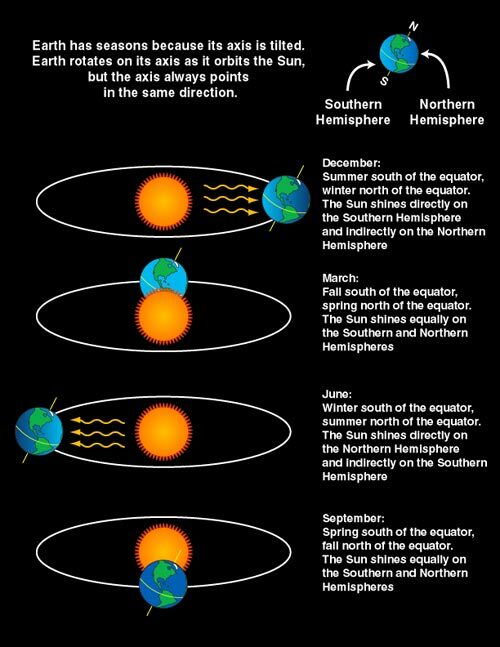 This not only masked the changes in solar radiation from the Milankovitch cycles but also masked the beginnings of seasonality resulting from the increased tilting of the earth. But, beginning in the late Cretaceous, sea levels fell and, after a series of oscillations, assumed their present relatively low level. As the moon continued retreating from its closest approach and its influence on tilting waned, the more subtle Milankovitch cycles began to emerge. These are the cycles that eventually cause ice ages alternating with interglacial warmth. The CALM proposes that a more distant moon during the pre-approach period “allowed” the earth’s axis to wander. We have seen that as the moon approached the earth during the Jurassic that dinosaurs lived within 5 degrees of the poles indicating a near vertical stance of the earth’s axis. As the moon again retreated, or “bounced” away from the earth, global cooling in high latitudes and increased seasonal contrasts became part of the following Cenozoic era (65 mya-today), our mammalian age. 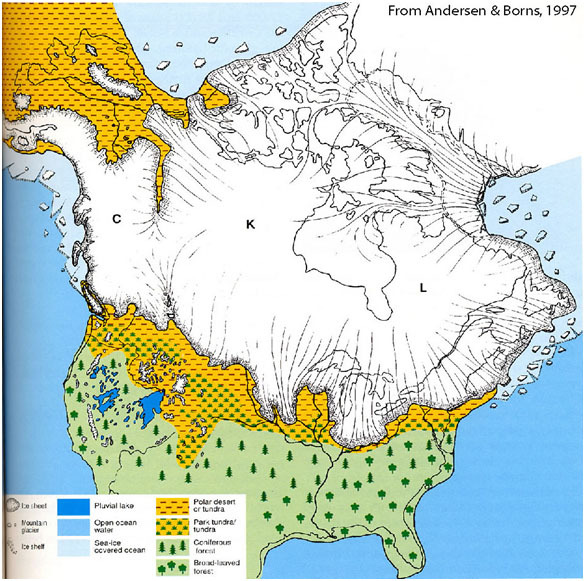 Generally lower temperature culminated in polar glaciations during the Eocene-Oligocene boundary (ca. 34 Ma) and Northern Hemisphere ice sheets first expanded about three and half million years ago. The modern configuration of the continents also contributed to this glacial pattern. 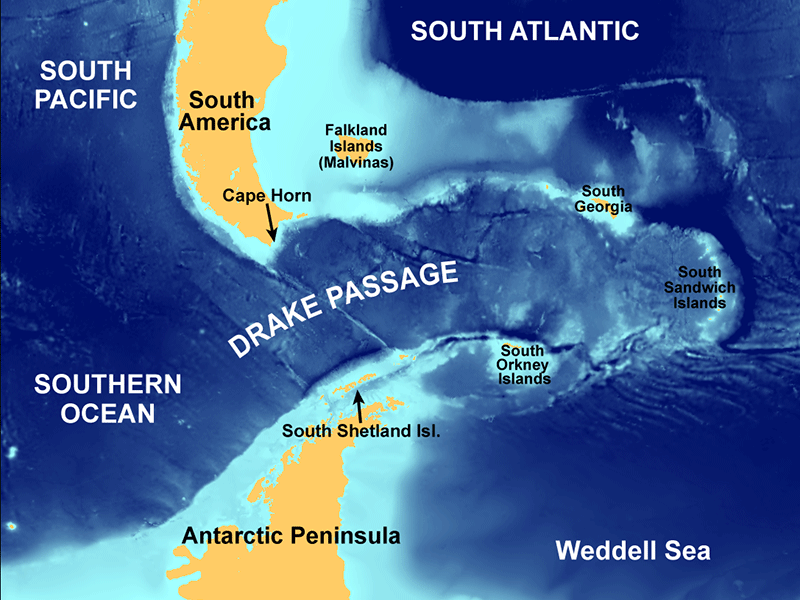 Antarctica being located over the South Pole and a nearly land locked Arctic Ocean are important geophysical components of climate. The opening of the circumpolar current with the separation of South America and Antarctica and the closing of the tropical seaway with the rise of the Panamanian isthmus played an important part in how our climate works today. Currently we are in a time of geologic warming known as an interglacial. An interglacial is the time between two glacial peaks. All the news today seems to be somehow related to what has become known as global warming. The discussion over global warming is really about whether man’s activities can influence or alter these naturally occurring cycles. Interestingly enough, back in the days of the Apollo missions, global cooling and a return to an ice age was considered a serious possibility. So what does our future hold, global warming or global cooling? The answer is yes, it just depends on your time horizon. The earth cycles through ice ages, largely because of the Milokavitch cycles. It also cycles in and out of warm and cold periods fairly regularly, even within the larger cycle of a full ice age. This is because of the tilting and wobbling of the earth, sunspots, deforestation, and other factors. Many of these cycles can be seen through cultural proxies. For example, between the seventeenth century and the early nineteenth century, during what is called the little ice age, temperatures in Europe were very cold. Frost festivals were occasionally held on the river Thames in London as the river froze over. Rembrandt’s paintings classically depict the winters of the little ice age. For four hundred years, prior to the little ice age, Greenland was warm enough for European settlers to homestead. Up to 4000 people lived in the Eastern settlement, one of three colonies in Greenland. The Greenland colonies surprisingly even had a bishop at one time. But by about 1400 A.D. the onset of the little ice age ended any contact with these colonies as sea pack ice formed across the north Atlantic. The great cathedrals of Europe were built during a particularly warm period. The abundance of resources during the time allowed for population to grow and wealth to accumulate. This cycle of warmth and prosperity is interspersed with periods of cold and decline which can be traced back throughout human history. Many people don’t realize that the tilting and wobbles of the earth’s spin are known to contribute to Earth’s changing climate. This is why Earth’s tilt matters. The CALM proposes that a more rapid retreat of the moon has weakened the moon’s influence on the tilt of the earth, leaving the earth’s axis more susceptible to wander. Add to this more unstable axial condition, the rather new feature of massive continental ice caps cyclically building and melting near the earth’s axis of rotation, and is it any wonder that the earth cycles in and out of ice ages? The melting of the ice sheets of Greenland and Antarctica has been shown to be impacting the earth’s tilt. Surprisingly even the changing ground water supply, some of it the pumping of ground water, has also been shown to increase this tilting. The direction of tilt has shifted starting in about 2000 from heading approximately towards Hudson Bay, Canada to now heading toward England and has doubled its speed up to nearly 7 inches a year. It must be remembered that only 10,000 years ago there was a 2 mile deep ice cap sitting over what is now Hudson Bay and this ice cap extended all the way to Cincinnati, Ohio. The rapid loss of this ice cap can be seen in the fact that Hudson Bay is actually rising, isostatically rebounding, over a centimeter a year. Geologically speaking this is double quick compared to “normal” tectonic activity. The earth’s tilt varies between 22.1 and 24.5 degrees over 41,000 years. It is currently at 23.4 and it is moving toward the more vertical stance. The tropic climate zone is currently expanding northwards 15’ a year because the earth’s axis is moving toward a more vertical stance. This is natural climate change separate from man-made climate change. It appears that the earth has reached such a penultimate condition that melting glaciers and shifting rain belts lead to altered tilting of the earth’s axis, thus increasing the intensity of seasonality. The increased seasonality i.e. tilt, leads to cooling which causes snow cover and more cooling which eventually results in arctic ice accumulation. The building of glaciers, given the earth’s current continental configuration, causes the earth’s axis to become more upright. The more vertical the earth’s axis, the less variation in temperature between summer and winter, and less seasonality. Warming and melting begin the cycle again. This is the stage we are in now. Add to these extremely complicated and finely tuned resonances, man’s contribution to greenhouse gases, and you can see how difficult it is for scientists to be able to decipher how much of global warming is attributed to humans and how much is part of the natural cycles that go back prior to recorded history.